Dear Students, as the first day of IBPS PO Preliminary Exam is over, you all must be enthusiastically waiting for the Memory Based Question Papers. So students, here is the most awaited Memory Based Paper of IBPS PO Prelims Exam entirely based on the new and exorbitantly changed pattern of questions asked this year. Students, the exam was really very knotty, especially to those who have just started preparing for competitive exams. Changed pattern of the examination was a bombshell that blew almost everyone’s mind who attempted the examination. 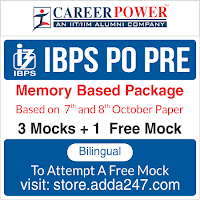 So, to get the students who are yet to appear for the examination acquainted with the pattern of examination, bankersadda is providing the memory based paper of IBPS PO Pre Exam. Practicing with the memory based paper helps in familiarizing the aspirants with the pattern of the exam. It helps them to ascertain how much time they spend on an average in solving a particular question and avoid situations where the bottom falls out of all their strategies when they get stuck pondering over a single low-scoring question for too long and thereby overlooking other high-scoring questions. By going through the memory based paper, you can work on your time management skills as well as the ability to deal with the changed pattern of questions, so that you are able to attempt maximum number of questions in a minimum time period. And when you have a fair idea of all your strengths and weaknesses, you can surely bring the house down.